Leather Dancing Pouches and Tote Baskets this WEEK! We had a good turnout for the seed swap this weekend. Seeds were traded and tips were shared. Thanks to our local gardeners and and backyard farmers. We hope to host another swap this spring! We ended our study of texture this week with an African mask making class. The children used black beans, crushed shells, dirt, paper, and twine to make animal masks while exploring the concepts of pattern and visual texture. Visit our website to sign up for our ongoing art classes. Be sure to attend the African mask exhibit at the Dallas Museum of Art before it ends in February. River is our youngest painting student to date. He and his family participated in our family painting class this weekend. Kayli taught proper studio practice and introduced families to the pleasures of making art together. Have you saved seeds from your garden? If you haven't, start collecting! Bring your pods and seeds to Oil and Cotton for our first ever SEED SWAP! Oak Cliff Community Gardens will join us from noon to 2pm this Saturday. O&C will provide glassine envelopes and materials for label making. This is a free community event, all are welcome. The very talented Shari Lidji is teaching a fibers class this Saturday, November 13th from 3-6pm. Students will use natural fibers such as burlap, hemp, cotton, and felt to make a table runner for the fall and winter holiday season. 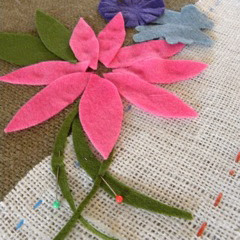 Learn basic embroidery and dress your table with a hand sewn linen. Register here. The House of MacGregor at Oil and Cotton! 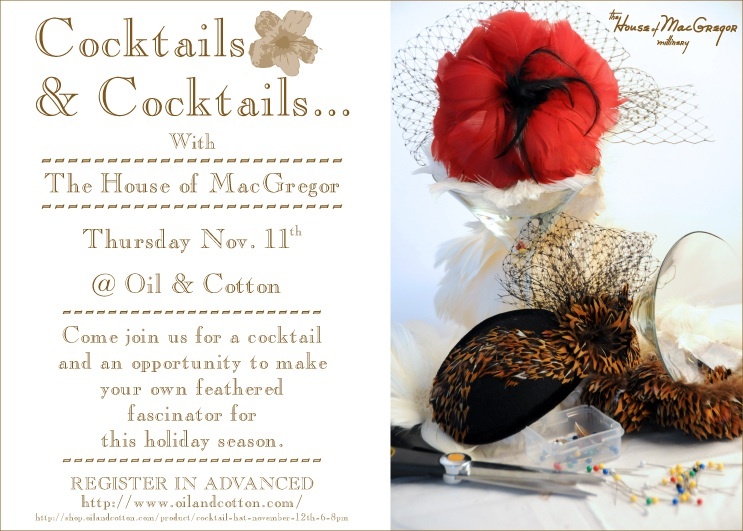 Learn to make a holiday cocktail hat with local milliner Cassie MacGregor, the Oil and Cotton Visiting Artist of November. Please visit our website or drop by to preregister for this class before November 11th. Show off your hat and join Cassie for a free talk and reception the following Friday November 12th, from 6:30-8pm. Preparing for Yule Logs and Woodland Holiday Ornament Class! Happy Halloween! As local rocker Ronnie Dawson would say, we had an "action packed" weekend! The wacky yellow bunny was one of our favorite pumpkins made during O&C's drop-in pumpkin decorating event. Folks decorated their gourds with paint, fabric, bunny ears and more. On Saturday, Jason Roberts, his lovely family, and Amy Cowan lugged a piano to Oil and Cotton for a makeover. The piano was delivered to the Dallas Art's District for Flora Street Fair. After a busy day of Clay and Crepes, we hosted a Super Spooky Piano Recital for Kayli's very talented students. Pianists performed original musical compositions for friends and family. Songs such as "Zombie Bride", "Crooked Skeleton" and "Devious Diesel Disaster" are sure to become Halloween standards. On Sunday, Oil and Cotton took it on the road. We helped neighborhood kids make trick or treat totes at Bolsa's street carnival and "Ghosts on a Stick" were made at Oil and Cotton's table at the Dallas Art's District block party. We ended Halloween with a HOWWWWLLLLL! Our first haunted house was creepy and crawly. Thanks to all of our talented ghosts, goblins, and monsters. We are already looking forward to our next haunting!